Let’s face it parents, sometimes it’s a major chore just to get our little darlings to take a bath or brush their teeth, so we have to get creative and practice a little bathroom psychology on them - turn their bathrooms into cool kid's bathrooms and they might just want to spend a few extra minutes in a room where scrubbing dirty elbows and knees and brushing teeth are target goals. 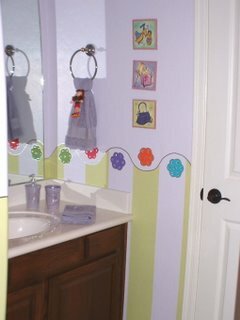 Children’s bathroom décor can be as fun and diverse as their precocious little personalities. It’s easy to get carried away with themes and colors in an attempt to make kids bathrooms exciting and fun, but the first order of children’s bathroom décor must be to ensure that it’s a safe place. A quick online search of safety products for kid's bathrooms will turn up a host of cool gadgets that are available in many colors and fun themes to enhance safety in the bathroom. Non-slip bathmats and appliqués; outlet and faucet covers; door-locks and toilet seat clamps; all are must have safety items for kids bathrooms and they can be incorporated into any décor. Inspiration can come from anywhere – restaurants, the pediatrician’s office, the nursery school or daycare center – anywhere children are frequent visitors. Get the kids involved in the creative process by having them cut out pictures of things they like from magazines, newspaper ads and toy catalogues – all great sources to inspire ideas for kids bathrooms - and paste them onto a poster board. Once they fill the board with pictures, shapes and colors, you’ll have a pretty good list of ideas. For kid’s bathrooms, the most important element of design is to make sure the room reflects their individual personalities. Contemporary and whimsical themes are popular because they’re an ‘anything goes’ décor. 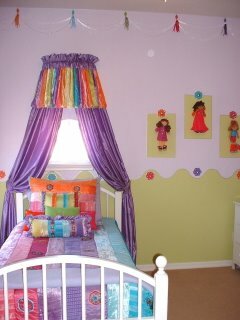 Children love bright colored spaces and color is the main component of the contemporary or whimsical décor. Whimsy can be anything that strikes their fancy. 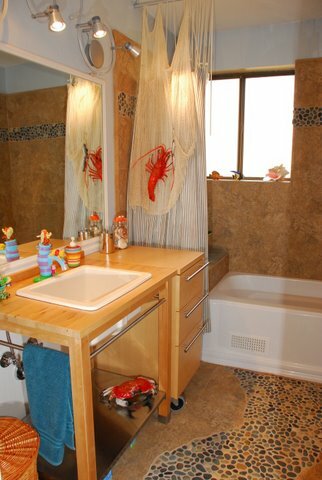 You might let them paint their handprints on the wall to personalize their space, or if you don’t want to get that wild with the walls, buy a fabric shower curtain and use fabric paint to create the same effect. Polka-dot walls make fun, happy spaces and they don’t have to be wild or dizzying. White polka-dots translate into bubbles when painted with translucent or pearl glaze and they imitate the mountain of suds in a bubble bath. For tile walls, self-stick appliqués can be put on in a hurry and changed quickly when you want to change the décor, plus they’re fun for the kids to play with. Kids can create their own scenery whenever and wherever they want. If the room is narrow and has high ceilings, paint horizontal stripes around the room to visually pull the ceiling down and create a cozy atmosphere. Kids love to feel cocooned, so creating a space that’s appears to wrap around them will make them feel safe. If the bathroom is small and adjoins the bedroom, carry the bedroom theme and color scheme into the bathroom. This works best in small bathrooms, particularly if there are no windows. 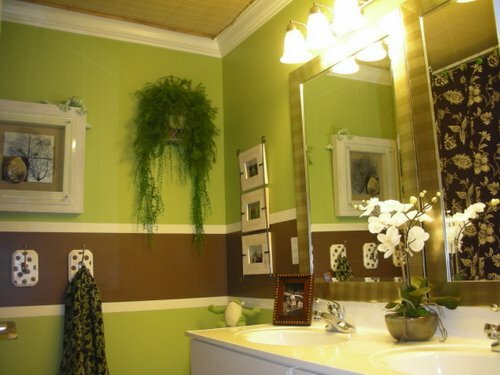 Keep the paint in the same color family but lighten or darken it a couple of shades to add interest and detail. The continuity of décor doesn’t have to be boring. If the bedroom décor is an intergalactic space station, make the bathroom the control-room of the spaceship; if the bedroom is a little girl’s fairytale, make the bathroom another one of the rooms in her castle. Many homes have shared bathrooms – usually called “Jack and Jill” baths - which connect two bedrooms. This can be a difficult space to decorate because often, they will connect a boy’s room and a girl’s room. Decorate shared kids bathrooms for both sexes by keeping the color scheme neutral; use accent pieces and accessories to define each individual space. Underwater themes work well in Jack and Jill baths because ocean themes offer a host of accessorizing possibilities – from mermaids and sea urchin’s - to dolphins and whales. Finally, when decorating bathrooms for kids, remember that the words ‘kids’ and ‘clean’ don’t usually go together; but if you personalize their space and give them a unique and really cool decor, they might at least become a little more compatible. Click here to decorate your dorm!